REgroup trucks like this one will soon be outfitted with side guards. Halifax will spend nearly a quarter of a million dollars installing side guards on trucks owned and operated by private businesses. Regional council voted on Tuesday to cover the costs for the life-saving devices on the 83 solid-waste collection trucks belonging to GFL Environmental and REgroup, respectively. The total cost to HRM works out to just over $238,000. Last year, the city started requiring side guards on all contracted service providers' vehicles over 4,500 kilograms. Tuesday's motion, however, marks the first time city hall has agreed to pay for a private business to install the protective barriers—something that didn't sit well with some councillors. In fact, we will. 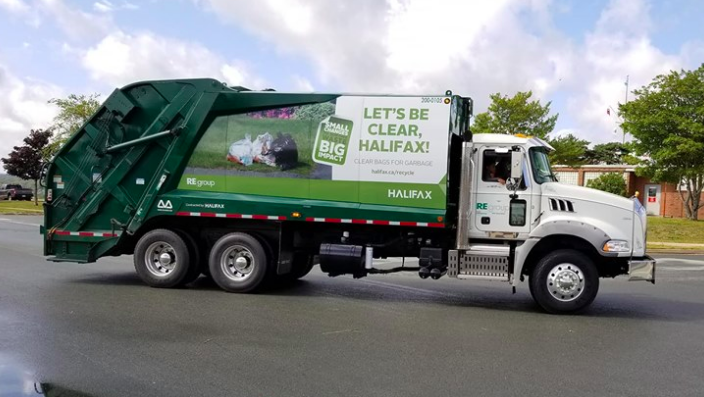 Halifax always pays for upgrades to its contractors' garbage trucks. Usually, that cost is just baked into the tender price though. The question before council this week was whether to wait two years until the current waste collection contracts end—hoping no one is killed in the interim—or move up the timetable and pay out of pocket for the side guards today. “Council’s going to end up paying for this, whether it’s part and parcel of the tender cost of paying for it separately,” said legal director John Traves. Council eventually agreed to get the side guards on the road as soon as possible. Only Waverley–Fall River–Musquodoboit Valley councillor Steve Streatch voted against the motion. Side guards work as a barrier, positioned between a truck's front and rear axles, preventing cyclists and pedestrians from sliding underneath during a collision. Their implementation has been championed by researchers and cycling advocates as an effective way to save lives, but the cost has also been criticized by the trucking industry. “Being safe, it costs money,” countered councillor Richard Zurawski. The Timberlea–Beechville–Clayton Park–Wedgewood representative noted that Tuesday's meeting began with a moment of silence for MaCali Cormier, the four-year-old girl run over and killed this past weekend in Yarmouth's Christmas parade. It's unclear if side guards would have made any difference in that death, though it's known side guards could have prevented four fatal collisions with right-turning vehicles on HRM's streets over the past 11 years. Side guards will be retrofitted on HRM's own fleet of vehicles as replacements are needed, with a total conversion expected by 2022.